An ESL lesson plan for teaching prepositions of place to beginners. It contains a lead-in activity along with some fun ESL activities and games. If you need to bring these materials into the classroom for reference, the TEFL Handbook app gives you offline access to all of the ESL resources on this site, plus a lot more. 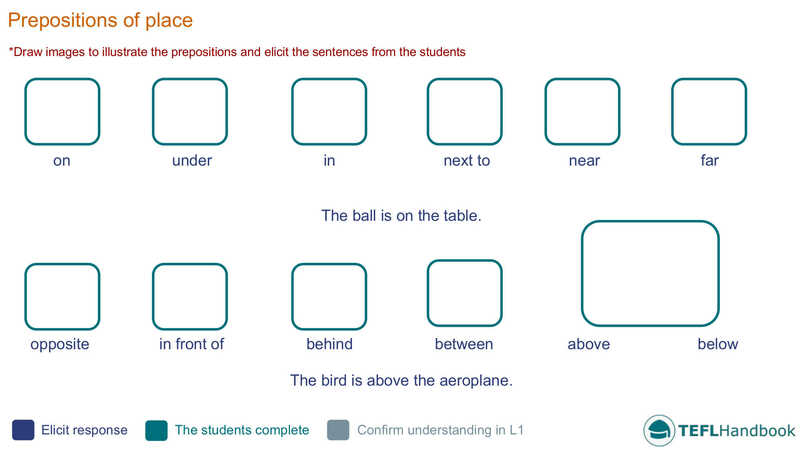 The sample board below illustrates one way that you could introduce or review prepositions of place. As the board implies, step through each preposition and use images to elicit them from the students. In this writing activity, the students will create phrases that describe images on the board. This activity works better if you have done the board work for the lesson. If you have used the sample board, have your students make five sentences that describe the images. If not, they can write about different objects in the classroom. Students will write sentences that describe a typical bedroom. 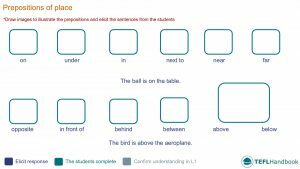 When you have finished your drawing, have the students select five objects and write sentences about them using the prepositions they have learned. For this activity, students will use the target language of the lesson to write a description of their bedroom. Before they begin, you could write a description of your bedroom on the board to help them get started. In my bedroom, there's a bed next to the wall. Here is one idea for a game that English teachers can use to teach prepositions of place. As usual, we only include game ideas that require no more than a whiteboard, markers and a dice. Students use questions containing prepositions to identify an item in the room that their classmate is thinking of. Teacher: Is it behind me? Teacher: Is it next to the boxes? Student B: Yes, it is. Teacher: Is it the radio? When the students understand how the game works, they can play themselves. The player who guesses correctly thinks of the next item. We hope that you were able to grab a few ideas from this lesson plan. Our suggested next lesson is on using There's/are. Be sure to check out our full list of ESL lesson plans for beginners (A1 Upper), as well as the complete collection. Also, if you are an iOS or Android user, the best way to view this content is through the TEFL Handbook app. An ESL lesson planner for English teachers, designed for in-class use.